International family planning assistance generates substantial health, economic and societal benefits for individuals, families and nations. Investments in international family planning are both impactful and cost-effective. Cutting international family planning aid would undermine the U.S. government’s foreign policy commitments to maternal and child health. Within days of the presidential inauguration, the Trump administration took drastic steps to undercut and dismantle U.S. support for global sexual and reproductive health and rights. First, it reinstated and expanded the global gag rule, which prevents foreign nongovernmental organizations (NGOs) that receive U.S. global health assistance from using private, non-U.S. funding to provide abortion services or information or to advocate for reform of abortion policies (see “When Antiabortion Ideology Turns into Foreign Policy: How the Global Gag Rule Erodes Health, Ethics and Democracy,” 2017). Next, without any investigation, it blocked funding for the United Nations Population Fund (UNFPA), which supports reproductive and maternal health programs in over 150 countries, based on a long-debunked allegation that the agency supports coercive abortion in China (see “The Global Gag Rule and Fights Over Funding UNFPA: The Issues That Won’t Go Away,” Spring 2015). Most recently, the Trump administration proposed the total elimination of funding for international family planning and reproductive health assistance in its fiscal year (FY) 2018 budget request, representing the first time that a presidential administration has tried to wipe out these programs altogether. For more than 50 years, the U.S. Agency for International Development (USAID) has built a track record of supporting international family planning and reproductive health programs in developing countries that markedly improve the well-being of women, families and societies. Now, these programs—and the hard-fought gains they garnered—are in danger. To be clear, the Trump administration has pushed for deep cuts to overall foreign aid, especially international development assistance, in line with its “America First” outlook—a misguided and ultimately counter-productive approach to U.S. national interests. American foreign assistance dollars, representing about 1% of the federal budget, stretch far in supporting programs that further health, peace and prosperity among developing countries. Yet, the attacks on family planning aid go even deeper, driven by antiabortion and anti–family planning animus as well as a general opposition to foreign aid. While the consistently underfunded international family planning budget accounts for a tiny fraction of overall U.S. foreign assistance, it plays an outsized role in advancing global health and development goals. Indeed, investments in international family planning and reproductive health produce a multitude of benefits. Contraceptive use improves the health of women, children and families. By allowing women to time and space the number of children they want, contraception prevents unintended, often high-risk pregnancies—too close together, too often, too early or too late in life—that can lead to maternal and child death and injury. New Guttmacher Institute research estimates that the number of women of reproductive age in developing regions worldwide who have an unmet need for contraception—that is, they want to avoid pregnancy but are not using a modern contraceptive method—has improved but remains high at 214 million women.1 These women account for 84% of all unintended pregnancies in developing regions (see chart 1).1 By satisfying this unmet need for modern contraception, the numbers of unintended pregnancies, unplanned births and abortions would drop by almost three-fourths. Additionally, longer birth intervals improve other child health and nutrition indicators, such as by increasing breastfeeding and reducing the incidence of stunting and underweight children.2 Finally, use of barrier contraceptive methods such as male and female condoms plays an important role in preventing the transmission of STIs, including HIV/AIDS. And all methods are useful in preventing the vertical transmission of HIV/AIDS from mother to child among HIV-positive women who wish to avoid pregnancy. Providing women with the tools they want to avoid unwanted pregnancies is also good for the environment. Satisfying women’s desires for smaller family size would lower population growth. Along with growing urbanization and migration patterns, population growth is one factor contributing to environmental degradation throughout the world and straining many countries’ natural resources. Notably, shrinking opportunities for individuals and communities to access natural, economic and social resources—such as water, food, land, education and jobs—may lead to greater societal instability. Sexual and reproductive health, including family planning, is critical to the fulfillment of human rights. Most fundamentally, access to sexual and reproductive health services enables individuals and couples to plan their sexual and reproductive lives, forming an essential aspect of human dignity and freedom. As pronounced at landmark United Nations conferences on women, population and development in Cairo in 1994 and Beijing in 1995, the right to control the number, spacing and timing of one’s children is fundamental to exercising reproductive rights.3,4 To do so means that individuals and couples must have the information and means to make informed decisions regarding their sexuality and reproduction. Moreover, the human right to family planning enables the exercise of other human rights, such as gender equality—for example, by allowing women to expand their life opportunities, increase their negotiating power and raise their socioeconomic status. The evidence is undeniable, however, that investing in contraceptive services and maternal and newborn services together is both cheaper and saves more lives than investing in maternal and newborn care alone (see chart 2).1 Fully investing in both sets of services would dramatically reduce maternal deaths by nearly three-fourths, from 308,000 to 84,000 per year, and newborn deaths from 2.7 million to 541,000 per year.1 Importantly, investments in family planning not only improve the health and well-being of women and their families, but save money as well. For each additional dollar spent on contraceptive services above the current level, the cost of pregnancy-related care would be reduced by $2.22. If the Trump administration is sincere about its commitment to ending preventable maternal and child deaths, then it cannot ignore the incontrovertible role that family planning plays in reaching its own stated goals. The United States should be increasing its investment in family planning, not cutting back. The current U.S. investment in international family planning and reproductive health programs has important benefits that would be erased if Congress agrees to the administration’s budget request. As the leading donor of international family planning assistance, the United States plays a major role in saving mothers’ and children’s lives. Its FY 2017 contribution of $607.5 million prevented a range of adverse outcomes.6 By providing 25 million women and couples with contraceptive services and supplies, U.S. funding made it possible to avert 7.4 million unintended pregnancies, 3.1 million abortions and 15,000 maternal deaths. As justification for zeroing out international family planning aid, the Trump administration asserted that “other stakeholders must do more to contribute their fair share to global health initiatives.”5 However, the United States has yet to meet its fair share of providing international family planning aid—currently at $1.5 billion, according to commitments made at the 1994 Cairo conference. Moreover, even as other donors have taken a strong stand in opposition to the U.S. attacks on global sexual and reproductive health and rights by offering both financial and moral support, their contributions cannot fill the large gap nor repair the immense damage created by the United States’ withdrawal. This article was made possible by a grant from the Universal Access Project. The conclusions and opinions expressed in this article, however, are those of the author and the Guttmacher Institute. 1. 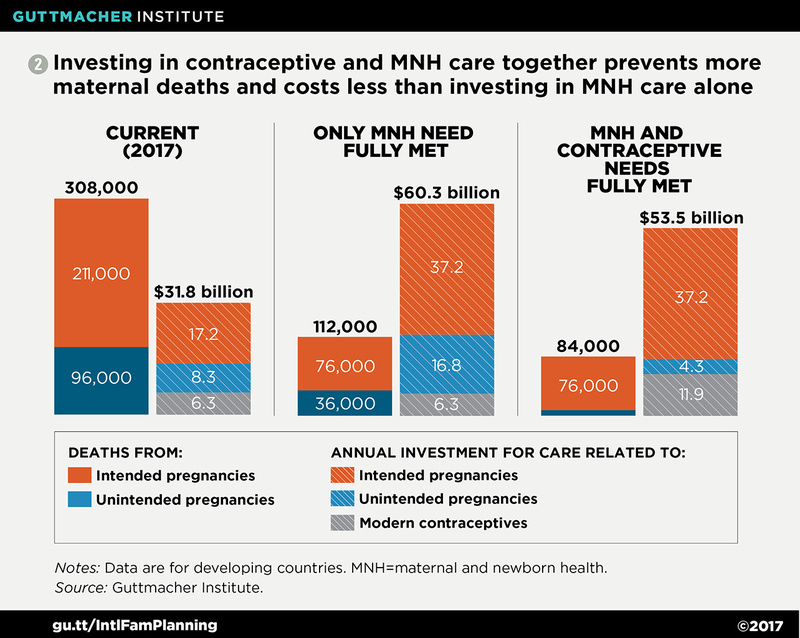 Guttmacher Institute, Adding it up: investing in contraception and maternal and newborn health, 2017, Fact Sheet, New York: Guttmacher Institute, 2017, https://www.guttmacher.org/fact-sheet/adding-it-up-contraception-mnh-2017. 2. Starbird E, Norton M and Marcus R, Investing in family planning: key to achieving the Sustainable Development Goals, Global Health: Science and Practice, 2016, 4(2): 191–210, http://www.ghspjournal.org/content/4/2/191.full.pdf. 4. Fourth World Conference on Women, Beijing, China, Sept. 4–15, 1995, Report of the Fourth World Conference on Women, A/CONF.177/20/Rev.1, New York: UN, 1996, http://www.un.org/womenwatch/daw/beijing/official.htm. 5. Bureau of Budget and Planning, U.S. Department of State, Congressional Budget Justification: Department of State, Foreign Operations, and Related Programs, Fiscal year 2018, 2017, https://www.state.gov/s/d/rm/rls/ebs/2018/pdf/index.htm.